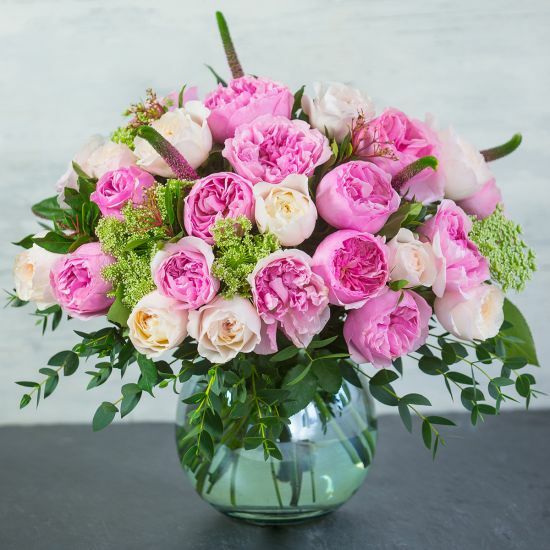 Miranda was part of the second generation of David Austin's Cut Roses and remains very popular today for weddings and events. This rose is remarkable for the giant blooms, made up of approximately 120 wavy petals, perfectly arranged to form beautiful, almost flat rosettes. When fully open, the heart of the flower is a pure rose pink, while the outer petals pale to the softest shade of pink. At the bud stage, the outer petals can be seen to have a lovely streaked green effect, which adds to the garden style, creating a look reminiscent of a parrot tulip. These outer petals gradually turn back and are hidden as the blooms open. Miranda has a delicate fruity fragrance. Named for Prospero's beautiful daughter in Shakespeare's The Tempest.